Who doesn’t want quick, cheap and good? This formerly NJ-based restaurant is now a food truck serving midtown and Union Square. I order via Seamless for my office lunch (No lunch break: boo! Free Lunch: Yay!) for a reliable Asian spice fix with the plus of being able to select brown rice. Where else can you find a brown rice bibimbap? Nowhere. Seoulfood’s spicy pork bibimbap is a treasure bowl of vegetables, pickled daikon and carrots, greens, kimchi, chili and spice. While their short rib and bulgogi leave much to be desired, the spicy pork is the star of this truck and is perfect in a taco, bun, or slider. I’ll take the bibimbap, thank you. 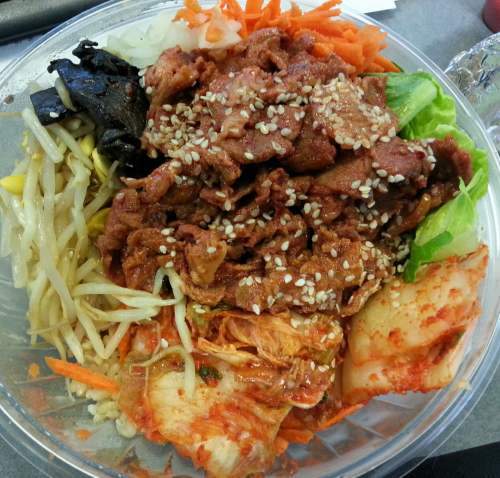 This entry was posted in asian, manhattan, Restaurants and tagged asian, bibimbap, food truck, korean, seoulfood on December 28, 2012 by admin.